OK! We are on Part Six of the How to Start Using Herbs series! Exciting stuff, right? Last time, in Part Five, you learned all about Tinctures, Acetums, and Glycerites. I hope you loved that section. Using tinctures, especially, is one of my favorite best ways to work with herbs. This week, we’ll go over more herbal preparations that are used internally: These are herbal syrups, oxymels, and infused honeys. You’re going to love this yummy part of the series! Last week, I shared information about different solvents, or menstruums, you can use to extract the useful chemical compounds from the herb to make an extract. Although the solvents discussed last week (alcohol, vinegar, and vegetable glycerine) are wonderful, there are some other solvents, albeit less effective, that taste delicious! These include honey, syrups, and oxymels. These types of herbal infusions are often useful for children because they contain no alcohol, and they taste pretty wonderful (especially the infused honeys and the syrups). These are are all good to cook with too. You can easily use them in dressings, marinades, dips, spreads, added to drinks, and more. By adding herbs to sweet and sour solvents like these, you get the benefits of the herbs in a tasty and culinarily useful way! These herbal preparations are wonderful ways to “let thy food be thy medicine,” as Hippocrates famously said. By the way, if you are interested in a fabulous online herbal education, The Herbal Academy of New England has some great courses for all levels and herbal interests! Now, on to the definitions, examples, and easy recipes for these herbal preparations! These sweet and/or sour herbal preparations (oxymels, syrups, & infused honeys) can be added to all kinds of drinks for their taste and health benefits. Find out how to make Forsythia syrup here! An oxymel is a mixture of honey and vinegar. It’s as simple as that. The word oxymel comes from the Italian “oxymeli,” which means acid and honey. These herbal concoctions have been used for thousands of years and have an excellent history of effectiveness. Even Hippocrates has been quoted as saying, “You will find the drink, called oxymel, often very useful….for it promotes expectoration and freedom of breathing!” —-Hippocrates, 400 B.C.E. When you add herbs to the mixture, you end up with a powerful and useful tonic or medicinal. The great thing about oxymels is the base of honey and vinegar has so many intrinsic health benefits already! You can find out more about the healing powers of honey along with remedies in that link. As for vinegar, I recommend you use raw apple cider vinegar. It’s very easy (and inexpensive) to make your own, but if you don’t want to make it, you can buy very high quality 5% acidity raw vinegar from Bragg’s. If you are wondering about tools you need, they are minimal. You can find out more about herbalist’s tools in this article: How to Start Using Herbs Part 3: Overview of Herbal Preparations and Herbalist’s Tools. Here is an Elderberry Oxymel that is just getting started. In about four weeks, it will be ready to use! There are several methods you can use to create an oxymel. I’ll go over my favorites for you here. Since the herbs need to be infused into the mixture, you either need to take the time for the infusion to take place in the actual oxymel, OR you can use an already infused herbal vinegar. For this method, you will need an herbal infusion in vinegar form, already made. Step 2) Fill the jar the rest of the way with honey. Step 3) Shake or stir until the honey is completely dissolved. A NOTE ABOUT RATIOS: The very old-school oxymel contained much more honey than a 1:1 ratio as above, especially if the herbs used tasted bad. In fact, some recipes call for as much as five parts honey to one part vinegar! You can adjust your own oxymel to contain more honey to vinegar for the taste. Just remember, that with this method, you will therefore also be reducing the amount of herbal matter. Step 1) Fill your jar about 1/3 of the way full of your dried herb. Step 2) Add equal parts honey and raw apple cider vinegar. Step 3) Stir until the honey is completely dissolved. Step 4) Put a plastic lid on the jar (or non-metal, as the vinegar will corrode it). Shake it every few days and allow it to infuse for around four weeks. Step 5) Strain off the herbs, bottle it up, and enjoy! Step 1) Combine 2/3 cup honey with 1/3 cup vinegar (or more, in the same ratio for a larger amount of oxymel). Mix until the honey is dissolved. Step 2) Add 1/3 cup of tincture, and mix again until all is completely mixed together. An option with this method is to make up a nice amount of oxymel base (just the honey and the vinegar) and keep it in a dark cupboard. Then you can add different herbal tinctures as you need them! This is a great option for using the strength of an alcohol tincture and improving the taste. How to Make the BEST Natural Decongestant That Really Works is in this article. You can find my recipe for Elderberry Oxymel in this article about staying well during cold and flu season. If you’d like my version of Fire Cider, which is also considered an oxymel, you can find it in this article. NOTE: I use molasses in mine, but you could easily substitute with honey. The result is still an oxymel either way. Get the Newsletter & Never Miss a Thing! Plus You'll Get Into the Free Resource Library! Here are the ingredients for one of my favorite oxymels: The BEST Decongestant Ever. It’s healing too. An herb infused honey is simply what it sounds like: herbs that are allowed to soak in honey for a period of time. The time the herbs spend infusing in the honey allows them to release their medicinal properties into the honey. This herbal preparation yields a delicious honey that has medicinal and health properties. The thing about using honey as a solvent for extracting herbal constituents is that it’s just not that strong. You won’t be able to extract nearly as many of the benefits of the herb. But you will definitely get some! And you’ll get a tasty treat, too. The directions are really simple. You just add your plant matter to the honey. Allow it to steep for one to two weeks. You can strain out the herb/plant matter or not. It’s up to you! ***Here is a recipe for Lemon-Infused Honey. This preparation is great for sore throats and to use in herbal teas. ***And here is one of my very favorite infused honeys: The BEST Cough Syrup You’ll Ever Make. You’ll like this because it’s quick (it only takes a day to infuse), and it works like a charm. NOTE: You can also add powdered herbs to honey and infuse it that way too. The powdered herb will become part of the infusion, and there is no straining necessary. Does this get your creative mind going? There is SO much you can create with a honey infusion. This simple cough syrup is effective and so, so simple to make. Some herbs that have a lot of water will create a mixture with the honey you don’t even have to cook out or let sit long. This syrup only takes a few hours, and no heating required. What is an Herbal Syrup? Plus, How Do You Make an Herbal Syrup? Herbal syrups are just plain delicious. You can use organic cane sugar, or you can use honey. You could even use molasses, if that suits your tastes. Syrups are quite forgiving in their deliciousness. Essentially, an herbal syrup is made by combining a strong decoction of herbal matter (remember we went over decoctions in How to Start Using Herbs Part 4: Herbal Water Infusions?) with honey or organic sugar to help thicken the decoction into a syrup. Adding the honey or sugar also helps preserve the syrup much longer than the decoction (strong tea) would last on its own. In fact, I’ve had elderberry syrup I’ve made last over six months in the refrigerator before! NOTE: You can make your syrup thicker or thinner, by adding more or less sugar or honey. That’s up to you. A thicker syrup will tend to last a little longer. Are you wondering what you can do with an herbal syrup? Well, if it is purely medicinal, you can take it by the teaspoon! Or you can add it to drinks like water or tea (this is how I drink up my elderberry syrup). Or you can even use it on top of pancakes! The possibilities are endless. And tasty. Here is some beautiful elderberry syrup! This is one of my favorite recipes to keep the cold and flu away from my body. You can read more about elderberries and how to make this syrup if you like. If you live in an area where wild roses grow, you can make your own lovely pink Rose Hip Syrup! Or, perhaps in the springtime, you have a beautiful Forsythia bush that blooms nearby? Here’s how to make a Golden Forsythia Syrup! And then…there is the traditional Elderberry Syrup that everyone wants in the Fall and Winter to help fight off illnesses. It’s easy to make! You can buy the berries if you don’t have them growing near you too! You can make all kinds of herbal syrups quickly and easily! The recipes above give you basic directions. 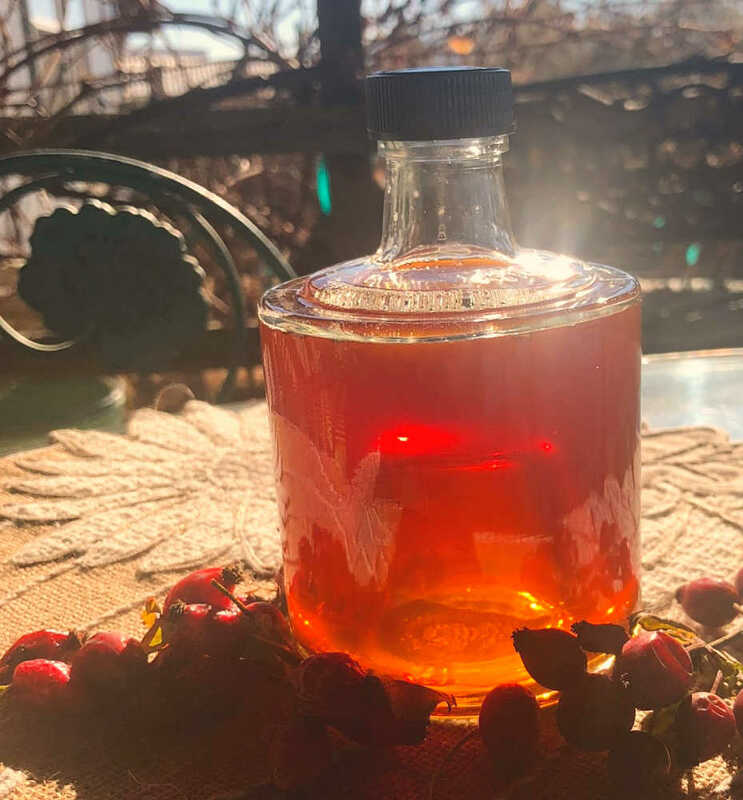 Here is another beautiful herbal syrup made with rose hips! You can see the directions and more about roses and rose hips if you like in that link. Isn’t herbalism just fabulous? I am obsessed! I love plants and all they can do for us. I especially love all the ways you can use their powers to help heal your body and stay healthy in an unhealthy world. If you are new to using herbs, perhaps start off making some of these sweeter herbal preparations. You’ll not only enjoy them, but you’ll get the medicinal benefits too. If you are hesitating to start—-start with something easy (like teas) or these simple sweet herbal offerings. I’d sure love to know what you think or if you have questions! How are you liking this series so far? If this is the first article you’ve read in this series on How to Start Using Herbs, maybe you’d like to start at the beginning? Here is a link to the first article: How to Start Using Herbs Part One: Which Herbs to Start With, Where to Source Your Herbs, How to Dry Herbs, and How to Store Your Herbs Properly. Each of these articles are pretty in-depth and long, but they will give you a very basic beginning foundation for beginning to experiment with using herbs in your life! If you want some GREAT resources, I recommend Rosemary Gladstar’s book, Medicinal Herbs: A Beginner’s Guide or Richo Cech’s, Making Plant Medicine. There are a lot of other resources available for helping you learn about using herbs too, and you can find out more about these in my article: 8 Simple Steps to Start Learning About How to Be an Herbalist. P.S. I’d LOVE if you sign up for the newsletter! You’ll also get immediate access to my free Resource Library! You’ll enjoy eBooks, guides, checklists, cheat sheets, and lots more over there, including this guide for How to Make an Herbal Tincture + Plant Proportions Guide. There are a lot of other valuable resources there too (including my eBook on How to Relax Using Herbs)! Your herbal preparations will take on the colors of the herbs you use. This forsythia syrup is a beautiful golden color. Isn’t it delightful? A springtime treat. Disclaimer: I am not a medical doctor. In no manner stated or implied, is any wording in this article or anything else I’ve written or said meant to treat, cure, diagnose, or prevent any illness or disease. Please be sure to seek council from your medical professional before you start using herbs or essential oils. These statements have not been evaluated by the FDA. Full Disclosures & Disclaimers here. Dec 10 How to Make a Cranberry Spice Sugar Scrub---Brighten Up Your Skin This Winter!